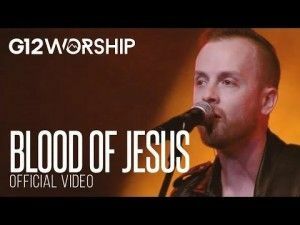 You may be unfamiliar with the band called G12 Worship, although they have been working together over the last few years as the collective of worship leaders from the G12 churches in the United States. However you may have heard of the band that preceded G12, known as Soulfire Revolution. As Soulfire Revolution they had some success signed to Sparrow Records with their album "Revival" that was released in 2013 and the Spanish language version won the Dove Award for Spanish Language Album of the Year in 2014. 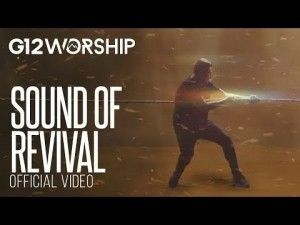 In 2015 Soulfire Revolution changed their focus sightly to become more aligned with the G12 churches and G12 Worship was born. I recently had the pleasure of chatting with Joceline, one of the vocalists from G12 Worship, over the telephone about joining G12 worship, their new single "All Things New" and her own blog about motherhood, which shows that with God's help it is a most beautiful thing. Scroll down and you can listen to the full interview with Joceline. So you're Joceline Raad, or did I hear that you like to be called Joey as well? They call me Joey but my full name is Joceline Raad. So Joceline, how long have you been working with G12, the worship side of G12? The worship side, I would say since Lorena Castellanos started with the project about 2, or 3 years ago. I came on board, so about 2 years. So you weren't part of the band when it was Soulfire Revolution, you came along when the change happened, is that right? Correct! I would sometimes sing background vocals for Soulfire whenever Lorena needed background vocals, but I wasn't officially part of the band. So how did you make the step up from doing background vocals with Soulfire Revolution to becoming a full vocalist with the band? OK so the way it happened was, our church here in Miami, G12 Miami, G12 church it's called formally, I had been part of the worship band for about 12 years and I used to worship alongside Lorena for about 12 years and when she told me about this new project and Soulfire becoming G12 Worship and how she wanted to gather worship leaders from different parts of the United States and that she thought of me, and she asked me if I wanted to be a part of it and I said "Of course, I would love to" and that's how it happened. So how does it work with G12, obviously it's a network of churches but you are putting out albums under the one name of G12, and songs under the name of G12 Worship. So how do you all collaborate? Do you have an occasional meeting somewhere, or is it all done digitally over conferencing, how does it work? Yes, so because we are in different parts of the United States, Luke Page, Luke Pew they live in California, I live in Miami, Lorena travels from Miami to Colombia often, so what we do is we gather, probably like twice, three times a year for songwriting sessions, that's when we come together with what we have and we just write songs for almost a week and sometimes it's during the annual conferences that we have in each city and that allows us to just come together and to song write. How does it work when it comes to performing together, because obviously you get bands that practice for hours every week to make sure that they all know how to read each others cues and things like that, particularly in the worship setting where things can move very easily as the Spirit moves things on. So how does that work with the rehearsing and playing together and to actually perform together in a worship setting? Yes, so the great thing is that each one of the band members, we're all worship leaders in our own churches, our own congregations, and I, for example, Lorena and I, because she is in Miami and I am in Miami, I worship with her every, we lead worship every week in our church, so we've been doing it for the past 12 years, so that helps. And with the others, just when we gather together we spend days and hours practicing, going over the songs, over and over, and also because we play the songs back at our home churches, it just makes it easier when we come together to practice at conferences and at events where we play together and move in one spirit. Excellent. 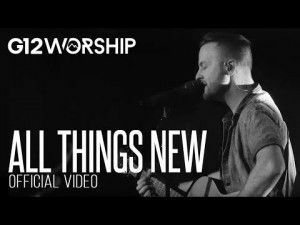 So what is the hope behind releasing "All Things New" the new single that you are releasing out to a wider audience, beyond the walls of your church or the specific brand of your church. What is the hope of doing that kind of thing? Is it because you have a worship style that you want people to experience, is it just about experiencing God in the worship that you're creating, or is it just trying to get people involved. There could be any number of reasons, but do you know what the 'official' reason is, the feeling and the spirit behind it to actually start releasing these songs to the wider Christian community. For the song "All Things New", one of our dreams is to be able to see it sung at every English speaking church, so that every member, and everyone who just comes into that church environment, that once they hear that song they will be able to sing along to it, but not just sing another song, but as they are singing that they can feel the presence of God like never before in their life, that they can feel that God is making everything new. That as they come with burdens , that as they begin to worship God through this song, as they begin to sing the lyrics to the song that they will be able to see themselves free and how God is with them, and how He just takes everything that we are and He makes everything new. So our past doesn't matter, He just transforms it and He makes it new. And how also if we come with fears before him, or with doubts, He will take that in that time of worship and He says "Don't be afraid", He is with us at all times and He is there making us fast through whatever situation we are going through He is there throughout the entire time. Was there any particular passage that Lorena, Luke, Anthony and Brandon were dwelling on at all when this song started to come to life. I know that these songs don't just come because someone is sat there writing them and then music comes along, quite often they're dwelling and soaking before the actual song arrives. Is that the case with this one, and do you know what they were dwelling on particularly? Correct, yes, so one of the main passages that we used to write this song that God spoke to us was in Isaiah 43, particularly verse 2 and 3, especially during the bridge when it says "When I go through deep waters you will be with me" and that's based off Isaiah 43, basically the entire bridge was "Don't fear, I am your God." We were able to get that verse and turn it into a declaration where everyone is able to sing and declare that, 'that I won't be afraid because you are my God, you are my Saviour, you are my redeemer.' So that's based off of Isaiah 43. It seems that with this particular track it's very much about us going through life, but turning those struggles and obstacles that we have in life and turning them around to be a place of praise. Would that be fair? There seems to be a few songs that are written, if you look back a few years ago there wasn't much that was saying "Life's difficult, life's a struggle, but God's going to get us through this. A few years ago there didn't seem to be very many of those, but there seems to be a lot of them coming out in the worship of different churches. Do you think that is the church realising that we need to be more real with our worship, or is it something that God is doing and God is saying? How do you feel that is? I think it is a mix of both that worship is taking that shift where songs are becoming more relatable to people, more real and it's also definitely that move from God and He's putting it in the hearts of the songwriters, of the worship leaders, to create these songs where everyone can relate, not just people inside church, but outside of church as well where new people can come and relate to the worship experience through these songs, through what we are singing and what we are saying. As they begin to sing they can declare these words because we know that words have power, and they can declare these words over their life and be free and be able to relate to God and to be able to engage and experience that change in their life through worship. Excellent! So what's the next thing, is there an album that this song is going to appear on in a few months time, are you working towards that? What's whats next for G12 worship? The next thing is releasing the full album that is already recorded. That's what I believe is the next step for us, so we are just praying and hoping that we will be able to successfully do that soon, hopefully before the year ends. That will be released on Dream Records as well, that's your label now, because obviously Soulfire Revolution was on one of the other labels, but G12 is very much on Dream now, is that right? It's always great to hear what is happening in the church, I understand that the G12 churches are experiencing a bit of an ongoing revival with people coming to know Christ and to be discipled through the church. Can you give me a little bit of insight into how you see that, and what is happening in the G12 churches in the US? Right now what is happening in the States is that we are seeing that there is definitely growth in the churches who are involved in G11. There is also that same spirit of unity of wanting to win and make disciples everywhere we go. So we are just experiencing that right now, and in that spirit of winning and trying to preach the Gospel to as many people as we can and across the United States every G12 church is experiencing that and trying to do that at their home churches. Focusing on not just winning new people, but taking them to really having a relationship with God where they can remain in God's path. Trying to bring changes to families, that's one of our visions and that's what we are seeing right now. In our church for example, our focus right now is not just winning just one person, but the entire family, the entire household, because we know that there is power when an entire family is won for Christ. Because we want to lift up Godly families in the United States which I believe that is what we really need in the US is to see families that believe in God, that serve God and that are an example to the rest of the families in the United States that don't have God. And we can preach that through our testimonies and through our lives. Excellent. I did a little bit of research and I knew you were called Joceline and I didn't know much else, and I found your blog. So you are very much living that out in what you are doing in your day to day life as an entrepreneur and everything else that you do on the blog and talking about, your most recent post, is about getting your babies to sleep, but you're not shy about putting that God is helping you through this! I can understand why if you have a third child on the way and you are going to have 3 under 3 I can see you will need all the help that God can give you there. It looks really good, so tell me a little bit about how your blog came about just a little bit about A Raad Story! Yes, thank you so much I didn't expect you to do this. That's actually one of the ways... I used to work full time before my husband and I were expecting our first. I became a full time stay at home Mum so transitioning from being a working woman to staying at home, I was like, 'I have to do something, God give me ideas!' But being a Mum is in itself a full-time job, but God put in my heart to be able to use my life to preach to women who don't know about God. While I was pregnant, something I noticed that women need , new mums, pregnant women is that encouragement in motherhood and pregnancy, because there is this fear, I believe. In the US many women fear becoming pregnant, they fear becoming a mum because they feel like their world is over, everything is going to end, everything tends to be negative. And my experience with the help of God was the exact opposite, from my pregnancy to the birth, to just being a new mum. I experienced the exact opposite, but it was only because of God, like I was able to see how my prayer...every time I thought something would be difficult for me I would just pray about it and God's hand was over every situation, whether with breastfeeding, or getting our babies to sleep through the night, everything was the exact opposite of what the world presents. So God put it on my heart to write about it. In the US, something that we see is how mothers go through Post-partum depression, anxiety, they become overwhelmed with becoming a new mum, and yes it's true, it's a lot of work when you are a new mum, waking up every 3 hours but it does not have to be seen as something negative that scares other women away from becoming parents. My experience was the exact opposite only because of God and my relationship with God, I was able to lean on Him every time. He was able to give us the wisdom to teach us how to become new parents and that's what I am trying to do through my blog. I am trying to reach not just Christians, but it's to reach non-Christians and teach them and show them that motherhood and pregnancy is not what the world paints it out to be, it's not what society says, but it could be the most beautiful experience if you allow it to be and if you lean on God for that. I really hope that I am able to do that through what I write and what I share. That's great because it's taking the worship from the church and making it very, very practical. It's taking something that God is doing in your life and making that very practical for somebody who's looking for someone who is going through that. It's all well and good having a midwife who tells you this is what's going to happen to you and you don't need to worry about this and that. It's good to have that, but if you've got a mum who has 2 kids and another on the way telling you, 'this is a great thing, I'm coping with it, and I'm coping with it through the power of God', that's worship in reality and life which is always good to express. Thanks very much for sharing about G12 and your blog. Thank you and have a blessed day. I hope that not just this song, but our album, is able to transform everyone's life when they hear these songs on the album and that they are really able to feel the presence of God in their life and be able to see a change. That is just one of our dreams for everyone from this album.